That je ne sais quoi feeling | Boy Mestizo: Hoy, London! It’s hard not to take notice when one of New York’s finest French restaurants decides that it’s about time to head over the Atlantic and set up shop in a prime location in Covent Garden. Before our big dinner together, I was able to get a ‘sneak preview’ of sorts when my brother scheduled the first of his many birthday dinners there (see here for another one of his birthday treats). I felt a bit naughty, getting there ahead of my friends, but sometimes in this cut-throat world of ours, you just have to look out for yourself. Not that having a birthday dinner with my brother and my darling mother was exactly the greatest act of betrayal. I think. It was a rather pleasant evening – sat amidst grand splendour, surrounded by scrubby yet chic mirrors and bathed in golden mood lighting, we dined well that night and generally quite enjoyed ourselves. I dined on a rather agreeable lapin à la moutarde, which was succulent and creamy, whilst my brother had steak tartare and oysters (which suited his low-carb diet perfectly, despite how extravagant and sumptuous that all sounds) and my mother had the moules frites. To finish things off, we had the raspberry soufflé with crème anglaise, which we were informed was their signature dessert. And it was delightful – once that spoon dug in through the crust, you entered a realm of saucy and smooth goodness. 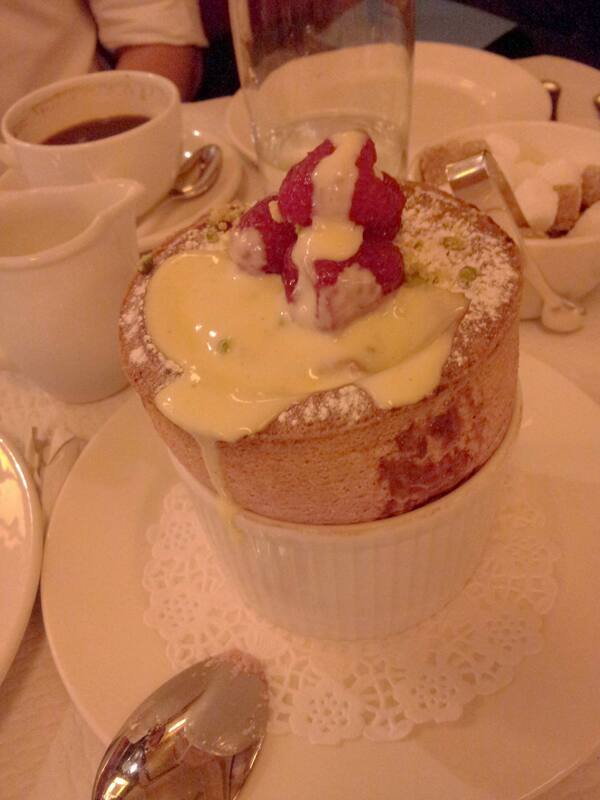 Never have I had a soufflé that delicate – it was a real triumph. But apart from that soufflé? All serviceable and well-executed dishes – but not mind-blowing. They were just decent, nothing more. Even trying to remember back to the rabbit I had is a bit of a struggle, as nothing from that dish jumped out as being absolutely amazing, as I would expect from a place of Balthazar’s hype. Was I wrong to have such high expectations, or would I just have to wait for my second visit in order to get that brilliant Balthazar experience? Alas, it was not quite to be – that second visit was a bit of an odd one. From getting one of my friend’s order wrong (a simple case of forgetting to take the bun out of the bunless burger) to completely wrecking another friend’s dining experience – she had to send her rack of lamb back TWICE, the first time because it was inexplicably half the size of the other rack of lamb on the table, the second time because it was still raw inside – we had a pretty rough time of it. You know when you’ve got that legitimate complaint but you’re too embarrassed to do anything about it? Yeah, that was us. Our waiter was absolutely amazing though, ever-willing to take that dish back until the kitchen got it right, no matter how much flak from the chef I’m sure he took. They were very quick to offer us her rack of lamb, as well as dessert for the entire table, on the house as a means of saying sorry – a pretty good recovery, and one that would make me doff my hat to them, if I wore hats. But still, it’s always very awkward and uncomfortable when you find yourself in that situation in the first place. Desserts for all, on the house! 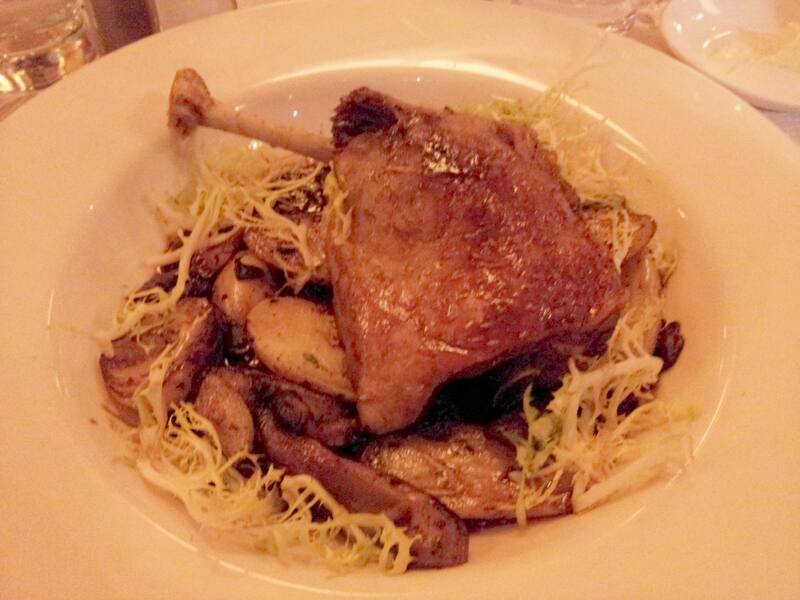 And now let’s look to the food: apart from having some of the biggest onion rings I have ever seen (which were crunchy and well-seasoned), I had the duck confit with roasted potatoes, cipollini onions, wild mushrooms and frisée salad. It was very tasty and delectable, with suitably crisp skin and tender duck meat, but again when I think back to it I am hard-pressed to consider myself wowed by it. 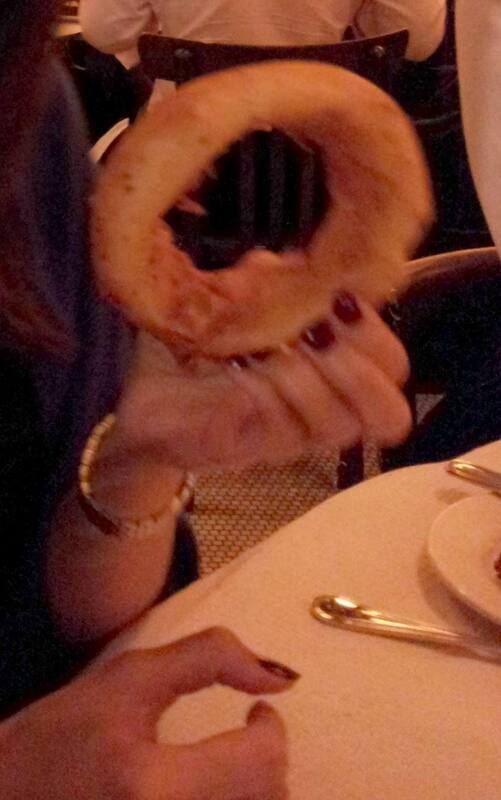 How big is that onion ring? 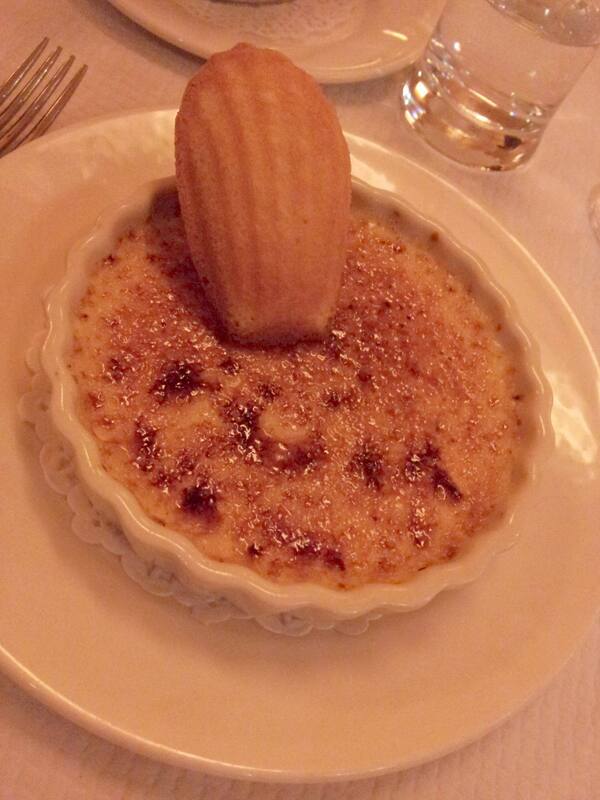 And let’s consider the crème brûlée – it did come with a wonderfully crisp and fluffy madeleine, but it was just short of absolutely creamy loveliness. I’m putting my neck on the line here, but I would offer up Le Relais de Venise’s version as one of the best ones I’ve had in London. Why this obsession with being wowed? Balthazar has come in to London, on a wave of hype, encased in an absolutely gorgeous Parisian bistro setting that feels so warm and comforting. When my friend made a dinner reservation for six, the earliest date they could offer her was nearly two months away. Surely it’s reasonable to expect that the food should live up to all that? But considering that I still rave about the meal that I had with my ex some years ago at the Bleeding Heart in Farringdon, and considering that I can still fondly remember most of the details of my experience with her at Clos Maggiore in Covent Garden, both of which are roughly similar (if just a smidgeon higher) in price to Balthazar, AND considering that I had just as much fun at the very reasonable neighbourhood bistro Le Sacré Coeur in Islington, ultimately I find that Balthazar is not the place I will be falling over myself to recommend to someone if they want an outstanding French meal. Certainly, go for the one-time experience, the mood, the atmosphere, the very extensive and commendable wine list (we enjoyed a bottle of the Château Villa Bel-Air ’07 from Graves, Bordeaux), heck even for a taste of proper and courteous service. Balthazar can give you all of that by the bucket load. But maybe do what my mum does when she and her friends baulk at paying through the nose for an expensive-and-not-quite-worth-it-yet-atmospheric restaurant: go there just for dessert (most certainly the raspberry soufflé – that is worth the trip) or for afternoon tea. VERDICT – An okay experience. The attempt to recreate a grand French bistro in New York and in London (I’m told they’re almost identical) is successful, and you could spend a lot of time there soaking up the bustling atmosphere and admiring les très français waiters avec leur je ne sais quoi… but if you’re looking to be wowed by the food, this is not the place for you.